This is actually pretty nice and not one-dimensional at all. A bit brute and on the nose, perhaps. 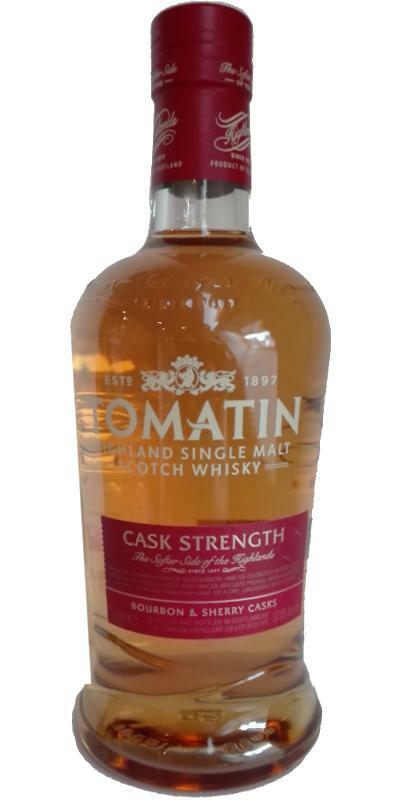 Somewhat surprisingly, it is also less fruity than I had expected for a younger Tomatin. It goes more toward fresh oak spices, with noticeable sherry influence and a blatant, candied sweetness. This would do well in autumn, paired with anything that has pumpkin in it. The finish, as is usually the case with these NAS cask-strength OBs, is nothing to write home about. Decent stuff, but one or two drams will suffice for me. This is a very much Oloroso influenced nose. A savory note, leather, shoe polish. But there is a quite 'nosable' note of the alcohol. Of course there are the red fruits, but they are more on the background. With water: Much more tamed down. It has the same smells, but less heat of the alcohol. Heavy, robust, very red fruit candy sweet. Then there is also the leather, hardy, shoe polish note which I think is quite good. With water: Very nice, less alcohol influence and more subtle red fruit influences. Medium-long length. Here again a lot of red fruits, it is a bit dry and gets a little tannic in the end. The finish is it's weakest point. With water you get more of the bourbon barrel influence, but it remains sherry dominated. Around €50,- is quite fair for this bottle. N: A big leathery malt with an blatant oloroso sherry ratio. Texturally, a little creamier when reduced to 46%. F: I’m exaggerating, a little. Finishes more rounded and balanced with a burnt butterscotch/corn/bourbon/sherry mixture. Was heading for 87, but -1 for the finish, or lack thereof. Fruity and creamy. Different kinds of desserts: Pineapple yoghurt, peach yoghurt, vanilla pudding, porridge and eventually crême brûlée. And water makes it even creamier. More sherried with caramel and berries. Vanilla, apple and chili pepper. Definitely a bit smoky. Water takes off the peppery edge and brings the bourbon notes back on top, but add too much and it turns a bit soapy. Dryer: Roasted nuts. The weak spot of this kind of young, cask-driven whiskies. Not bad, but nowhere near the fragrant nose and full taste.